The meat has been planted. A little frozen, but generally, looking good. I arranged the meat on the plate, and walked across the block to my neighbor's yard. I had enlisted a little help. Chad, the official stinkymeat assistant, kept a close watch on the surrounding area as I tiptoed across my neighbor's property and placed the meat on the ground. I think we were undetected by the neighbors - however, a passing motorist took some notice of us. Hopefully, they wouldn't be able to identify us in a lineup. So far, the meat is scentless. 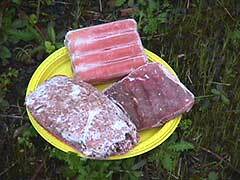 It began to thaw while we were there, and by tomorrow I am hoping to have some large blobs of naturally warmed beef.